So you have a human? I have a human too! My human took me all over at your event this year and introduced me to everybody. I didn’t have just one human. 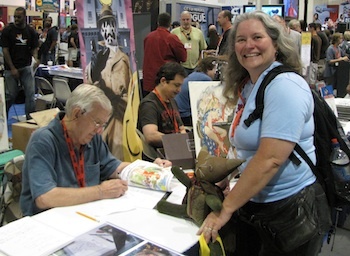 The blog post by Scott Shaw talks about all the different humans who helped create me as does my official About Comic-Con page. And there are so many more humans now that make me what I am today. Oh! Oh! I think my human knows one of your humans, Greg Bear. My human said she went to his talk at San Diego State recently. I wasn’t there. She didn’t bring me. But she kept on saying “That’s so cool!” afterwards. I think I like that phrase. I may keep it.